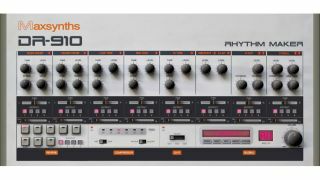 You probably don't need us to tell you that MaxSynths' new DR-910 Windows VST plugin is inspired by Roland's TR-909 drum machine. In fact, it's said to be a faithful emulation of it. Several additional features have been thrown into the mix, too. There's a reverb unit with independent send controls for each sound, a compressor that's designed specifically for drum sounds, and a lo-fi FX device. The theory is that these processors will enable you to shape your sound without the need for external plugins, but there are four stereo outputs that each drum module can be routed to should you need them. DR-910 is available now as a 32-bit Windows VST plugin. You can purchased it for €24.99 from the MaxSynths website, where a demo is also available.